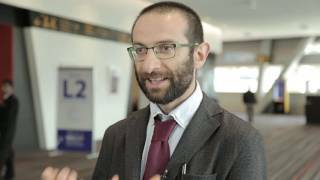 Paolo Bossi, MD of Fondazione IRCCS Istituto Nazionale dei Tumori, Milan, Italy discusses the role of probiotics in gut mucositis, as a new field of research investigating the role of microbiota in mucositis emerges. The goal of the research is to understand whether change in patient’s microbiome can result in mucositis reduction. Dr Bossi mentions that for gut mucositis it is important to give patients probiotics, in particular during radiation. He finishes off with the mention that there needs to be an improvement of knowledge for dysbiosis in gut mucositis, however, the field is not well researched at present. Recorded at the Multinational Association of Supportive Care in Cancer (MASCC) and International Society of Ocular Oncology (ISOO) 2016 Annual Meeting on Supportive Care in Cancer held in Adelaide, Australia.